great solar system colors. I like the mixture of purple and blue. Such a cute little traveler! What a sweet little illustration. This is probably one alien you wouldn't mind visiting earth. Gorgeous colours, and a very cute alien! 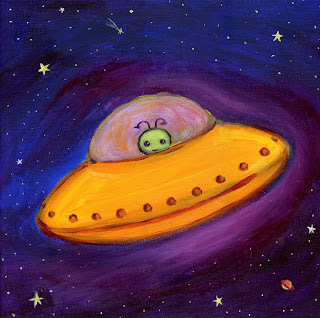 Cute little alien, I wonder if he'll come pick me up for a spin in his saucer. Aw, such a cutie :-D Nice colors, too!